Image Size 9" x 15"
Internationally recognized as one of the world's finest wildlife artists. David Shepherd has at all times felt that he had a duty in the form of conservation towards the world and the animals that inhabit our planet. In his lifetime, David Shepherd has painted and drawn many pictures, and is able to share his many tales and experiences with people internationally, often talking at charity dinners and prestigeous social events. His persona lends itself naturally to this cause, as he is a most approachable down-to-earth fellow who enjoys sharing his pleasure of art and his concern over the diminishing wildlife throughout the world. In his early days, he was 'thrown' into the creative world purely by chance, as he wasn't particularly keen about other college activities. David Shepherd is commonly quoted as saying that upto his late teens his life was not very successful, as he always had an ambition to be a game warden in Africa. So after ending his schooling, David Shepherd left England with the concept of a career within the national parks of Africa. Unfortunately, he was promptly instructed that there was no place for him, and his childhood desires lay in ruins. Throughout school days, his foremost curiosity in art had been as a substitute for the compulsary games of rugby which left him with a fear of dread. David Shepherd's first autobiographical book 'The Man Who Loves Giants' was published in 1976 which very quickly became a best seller. This was revised and updated in 1989 as subsequent editions were published. and in 1985 'The Man and his Paintings' was the first comprehensive book showing a complete spectrum of David's work. 'My Painting Life' and 'Only One World' were published in 1995.
was the title for this film of David Shepherd's life story produced in 1972 by the late James Stewart. 'The Last Train to Mulobezi' tells an exciting story of the survival of an ancient locomotive and railway coach from the Zambezi Sawmills Railway and their 12,000 mile journey back to England. The train was given as a gift by Dr Kenneth Kaunda, the President of Zambia, and after raising enough money through the sale of paintings in USA. A helicopter was bought and given to Zambia to help prevent poaching. Constantly on the move, his work takes him tirelessly from one continent to another. 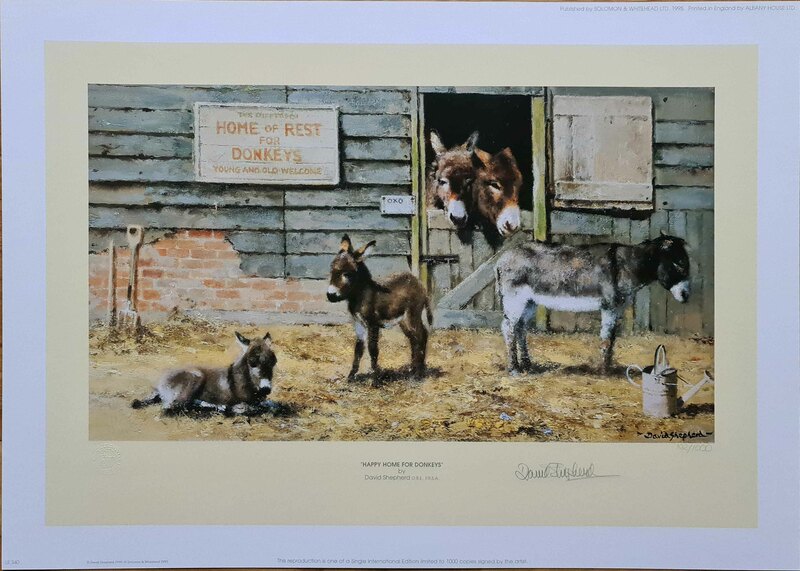 Admired and respected by many, David Shepherd is regarded as being the world's leading wildlife painter. His signed, limited edition prints can be seen in many homes throughout the world and he is always on the move and enjoying his life to the fullest. "I want to live to be 150. It will take that long to do everything I want to do. Unlike some people who perhaps lead a humdrum existence, I run almost everywhere I go because I am so anxious to get on with the joy of what I am doing next." Having celebrated his 70th birthday on 25th April 2001 with a fundraising dinner at the Natural History Museum, which raised over £100,000 for's wildlife projects. He has recently celebrated his 80th birthday with another successful fundraising dinner at the Natural History Museum, attended by a host of celebrities and many admirers of his work. David Shepherd now lives with his wife Avril in Sussex. His four daughters who all share his passion for conservation and are involved in David Shepherd's wildlife conservation work.